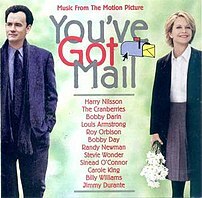 As soon as I put up the post about the soundtrack for Sleepless In Seattle, another Tom Hanks/Meg Ryan movie came to mind. That is the romantic comedy You’ve Got Mail. The movie is clever and fun. Tom Hanks is always easy to watch and Meg Ryan is pretty cute in this part. there are some great people in the supporting cast. Look for Dave Chapelle in what, I am pretty sure, was his first movie role as Tom’s assistant at Fox Books. The musical selections are terrific and, again, they really feed the story. Once more, like Sleepless In Seattle, the movie climaxes with the incomparable Jimmy Durante setting the mood with You Made Me Love You. It can’t get any better than that. Listen to this lineup of performers: Harry Nilsson, Bobby Darin, Louis Armstrong, Roy Orbison, Stevie Wonder, Carole King, Billy Williams and Jimmy Durante. Also included, but maybe not as familiar, The Cranberries and Bobby Day (with Rockin’ Robin). Harry Nilsson is featured on three tracks and, if you have not given him a listen in recent years, by all means do so. He does The Puppy Song (cute), Remember (very pretty song) and one of the three best versions of Over the Rainbow you will ever hear. (The other two are, obviously, Judy Garland’s original from the movie, and Jane Monheit. Jane Monheit, btw, is one of the best of today’s jazz, cabaret, ballad, swing & showtune performers. She tours with her own excellent band led by her husband, Rick Montalbano, and featuring his excellent custom arrangements. If you get a chance to see them live, especially in one of the small, intimate venues they prefer. her website has some good samplings from her impressive album catalog . Here is the link: http://janemonheitonline.com/ A Jane Monheit CD is always a safe investment.